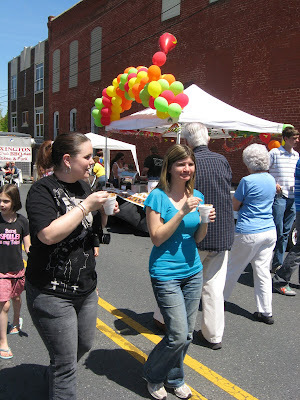 If you missed the Asheboro Chili Cook Off on 4-18-09 or even if you went (and like to Google around and see if you're online), here are some of the photos from the first annual street festival. 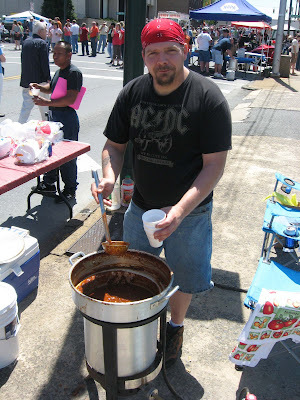 Visiting from Jugtown to make up a big pot of chili. Fancy meeting you up here. 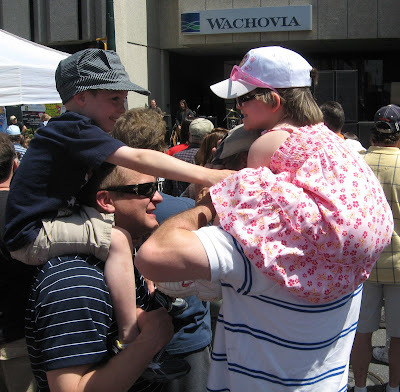 I'll bet my Daddy can walk faster than yours. Oh yeah. Well, mine is taller. OK. So, let's just be buddies. Catch you back on the ground. 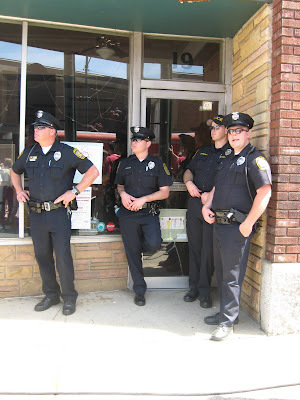 The Asheboro police officers were out and keeping an eye on things. They found a little shade here on a hot day. It was a little noisy right next to the speakers for the band, but it was a laid back crowd with everyone from Grandmas to infants. And, everyone was playing nice. I guess chili just brings out the best in everyone. And, I hope the officers got some too. With 20 to 30 thousand in town, they had a busy day. Hey. I know this man. He's Joel Burger. No. Not really. He is Joel, but his last name is not burger. I just think of him as Joel Burger, because he has a blog about his burger with pimento cheese that is served in Winston. I have that on my road trip map for soon. Can you eat chili and walk? It's kind of like chewing gum and walking. Some can. Some can't. Looks like these festival visitors had it down. 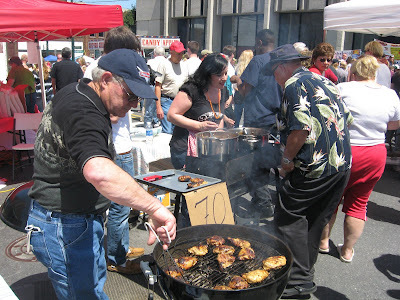 It wasn't all chili at the festival. Light up grills, and you're going to have a whole lot of meat sizzling. Now, I'm hungry again and sure wish I had a piece of that grilled chicken. 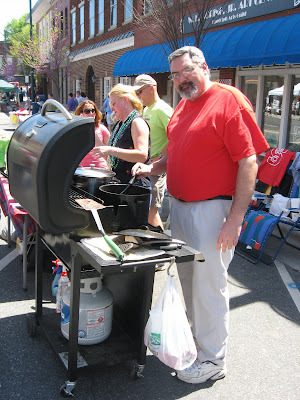 I did score steak at the Fresh Cuts booth (the local butcher's booth). They not only rocked that steak, they also won the Chili contest. Now, that's a meat man you can trust.